Six Oaklawn-raced horses have enough points to run in the 2019 Kentucky Derby, including Omaha Beach and Improbable, the top two finishers in Saturday’s Arkansas Derby (G1). Omaha Beach exited his one-length victory in good order, Hall of Fame trainer Richard Mandella said Sunday morning, adding the War Front colt, owned by Rick Porter’s Fox Hill Farm, will probably be vanned Tuesday to Churchill Downs to begin preparations for the May 4 Run for the Roses. The Arkansas Derby represented the third consecutive victory for the rapidly improving Omaha Beach, who has found a home on dirt after losing his first three career starts on turf. Omaha Beach broke his maiden by nine lengths Feb. 2 at Santa Anita, then won the second division of the Rebel Stakes (G2) March 16 by a nose over Game Winner, Hall of Fame trainer Bob Baffert’s previously unbeaten 2-year-old champion. 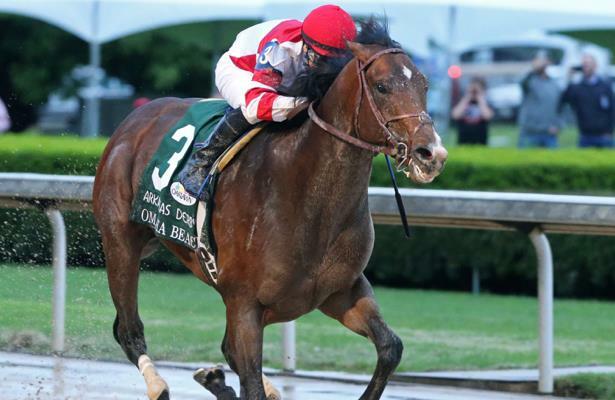 Omaha Beach received a preliminary Beyer Speed Figure of 101 for his Arkansas Derby victory – a career high – after generating a 90 for his 7-furlong maiden victory and a 96 for the 1 1/16-mile Rebel, his stakes debut and the final major local prep for the Arkansas Derby. Before an estimated crowd of 45,000, Omaha Beach ($5.40) was the slight 8-5 favorite over Improbable (9-5). Ridden by Hall of Fame jockey Mike Smith, Omaha Beach ran 1 1/8 miles over a sloppy track in 1:49.91, slightly faster than Quip’s winning time in the Oaklawn Handicap (G2) for older horses about 90 minutes earlier. Omaha Beach carried equal top weight of 122 pounds. The Arkansas Derby offered 170 points to the top four finishers (100-40-20-10) toward starting eligibility for the Kentucky Derby. According to Churchill Downs’ official Kentucky Derby points rankings, Omaha Beach ranks second with 137.5. The Kentucky Derby is limited to 20 starters. If the race overfills, starting preference is given to horses with the highest point totals in designated races like the Arkansas Derby. A Tex Sutton flight is scheduled Monday from Little Rock, Ark. (roughly 50 miles northeast of Hot Springs) to Lexington, Ky. (roughly 80 miles east of Churchill Downs), but Mandella said he prefers to van Omaha Beach to Kentucky. Omaha Beach was flown from his Southern California base to Arkansas last Tuesday. Mandella, 68, is seeking his first Kentucky Derby victory. His best finish with six starters to date, Soul of the Matter, was fifth in 1994. Conversely, Baffert, Mandella’s Santa Anita neighbor, has won the Kentucky Derby five times, the last two with eventual Triple Crown winners American Pharoah (2015) and Justify (2018). Baffert, Mandella kidded, had been giving lessons on how to win the Kentucky Derby – until roughly 10 weeks ago. “Baffert, he quit helping me when I got a real shot,” Mandella said. Omaha Beach earned $600,000 for the victory, his third in seven starts, to raise his career bankroll to $1,121,800. Three Arkansas Derby winners have captured the Kentucky Derby – Sunny’s Halo (1983), Smarty Jones (2004) and American Pharoah (2015). All three also won the Rebel.